Whipcracking is a sport offering potential development of great skill, whether in accuracy of cutting targets, manipulating targets, or in multiple cracking, keeping one or more whips cracking in a repetitive sequence. Whips are the tools used. While a skilled whip artist can do surprising tricks with a poor whip, good whips are essential in developing good skills and routines. It is much easier to learn to crack with a good whip than with a poor one. A good whip will move out and crack when it is thrown with very little effort, and will retain its shape and structural integrity over many years of use. While there are many styles of whips, the choice for whip cracking is between bullwhips and Australian stock whips. from its former state, there are still good stock whips available. Price and quality usually go together, but take heed of the old Australian admonition — “Never buy a whip from someone you don’t trust”. Only the whipmaker knows what is inside the whip and how well it is made. a longer thong is usual to allow more time to reach for the catch. Wraps often require long thongs, say 10 foot or even 12 foot for body wraps. Thongs 8 foot or under are mostly preferred for multiple cracking. Longer thongs are both difficult to keep moving and off the ground. Shorter thongs allow a greater variety of routines, and give a faster action. In the competition whip cracking which has recently been highly developed in Australia thongs as short as 5 foot are used where the pathways of the whips are using the same space. Selection of a bullwhip is rather more difficult. 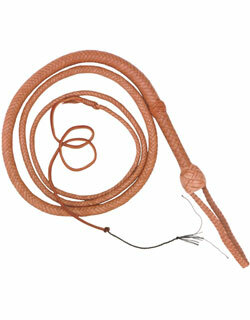 American bullwhips at the peak of their development in the 1920’s were good quality machine braided utility whips. Performers could use these, with or without the end being braided down to a finer point, or could have whips made by the whip makers still doing hand work. The manufacture of quality whips virtually died out in America by the Second World War, but underwent a modest revival following the Indiana Jones movies in the 1980’s. Commercial production is largely confined to the cheaper grades. A number of amateurs are trying to develop skills under the difficult conditions of having neither apprenticeship with a skilled whip maker nor a large and knowledgeable market that could help them. If you buy a whip from someone who braids well but has minimal experience with whips try out the whip first for balance and shape. The mechanical aspects of putting a whip together are critical but not unduly difficult to learn. Far more difficult, and requiring considerable experience in both making and using whips, is getting the weight, balance, and shape right. Some bullwhips are made in Australia, but bullwhips have never been commonly used there and, being made just for tourists or for a far-off American market, most are made much as an odd shaped stock whip rather than a true bullwhip. Bullwhips are particularly suitable for the style of work seen in the older movies, as well as the Indiana Jones series, cutting or manipulating targets, small wraps as in taking the gun away from the villain, large body wraps, or simple multiple cracking, as taking out multiple targets. They do not lend themselves to the more complicated multiple cracking of Australian competition cracking. They are heavier and slower than stock whips, and as such more suitable for routines where the drama is enhanced by the time taken for the whip to roll out. For a first bullwhip the best length is about 8 foot. Restricted space may require a shorter whip, as a 6 foot, but a 6 foot whip does not flow out so well as an 8 foot. A 10 foot whip is manageable, but requires more effort and skill to keep it off the ground. Anything under 6 foot or over 10 foot should be left for special routines. The synthetic material used in these whips is very strong, and it can be easily cleaned. A synthetic whip doesn’t deteriorate. They are a little lighter than our handcrafted leather whips, so they have to be thrown a little harder to make them crack. They can be a good choice for a place where leather might deteriorate or get cut against a hard surface. If you are a beginner and would like to try your hand on a whip, and don’t want to spend the money on a leather whip, this is a good place to start. Remember, the tip of a whip moves fast, with the speed and energy to break the sound barrier. It can damage people and objects. Handle your whip safely, in a clear area.